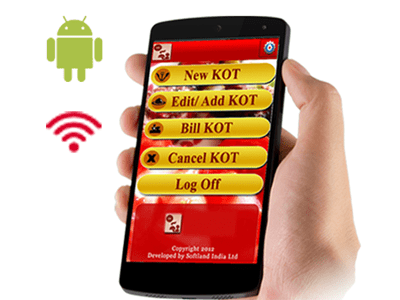 SIL KOT is an End to End Kitchen Order and Billing System, Ideally suited for Restaurant Billing, Hotel Billing, Restaurant Order taking, Android Hotel Billing, Android Restaurant Billing, Android Tab Based Billing, Steward Order taking, Table Billing, Order Taking and Billing Etc for the automating the Order Booking, and Billing so as to enhance the Speed and Efficiency for Enhanced Customer Satisfaction. 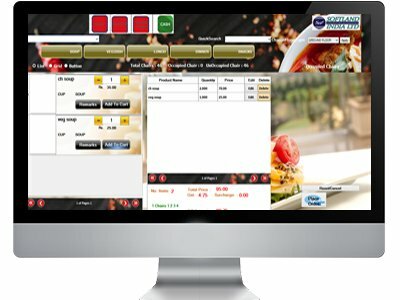 Restaurant Solution will handle various processes like menu preparation,seat allotting ,steward ordering, waiter ordering, delivery, food availability, billing process, final reconcilation and various features like Low Cost Restaurant System, Low Cost Hotel Billing System, Cheap Restaurant Billing System, Cheap Hotel Billing System,Cost Effective Restaurant System,Cost Effective Hotel Billing System,Waiter Billing System,Steward Billing System. - Facility to select chair & table. - Facility to place new KOT. - Facility to add additional KOT. - Facility to edit running KOT . - Facility to bill KOT. - Facility to add discount. - Facility to cancel KOT. - Facility to bill/ parcel / takeaway KOT. - Facility to collect payment against respective order. - Facility to add customer data. - Facility to select pre-entered. - Facility to add parcel/takeaway order. - Facility to add parcel/takeaway order. - Add room based item rate. - Add item based remarks. - Generate sales and audit report. PC application will be installed in the server, seperate logins will be given to cashier and kitchen staff,the waiters will be provided with an Android Device like a Tab or Mobile Phone loaded with our application. The waiters after finding the taste of the customers, select the specific Menu Options and Choose the Food Items. There can as much Categories of Food as the Restaurant may have. Namely Arabic, Continental, Chinese, Indian etc. The Table Number will also be Selected and updated. Each tab button will then have the list of Food in a particular Category with short description of the Recipe and Prices along with the images. 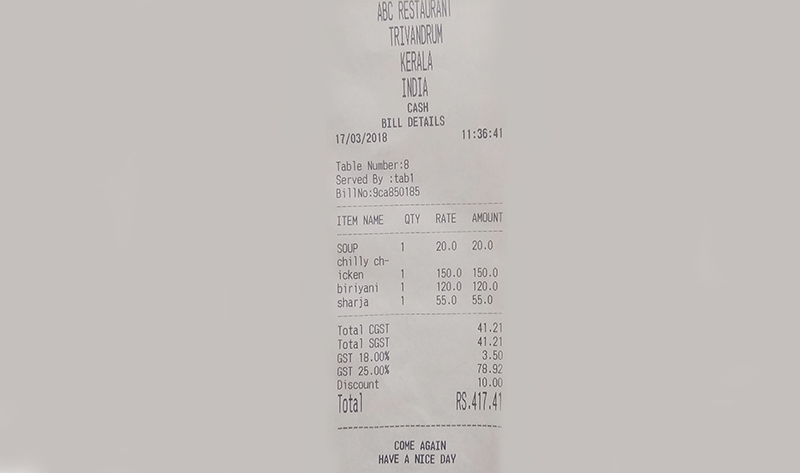 On confirming the selection of Food items a Kitchen Order Token will be printed at the Chef Location in the Kitchen with the details of the Chairs and Table Number or Location of the Customer. The Food is then prepared and served to the satisfaction of the customer. The Process Continues till the Ordering is complete. All these details will be updated in cashier screen(PC application) through wifi,the Cashier can print the Bill on the Portable Mini Printer on his Desk by selecting the table no. For Home delivery orders and take away orders the cashier can take orders by selecting the items,entering their name,phone number and address for delivery(for existing customers on entering phone number other details will be shortlisted),the same will be printed in the printer kept in kitchen for chefs attention. All these devices will be synchronized with the Server Application through Wifi(Intranet). The master data for the waiters, halls, menu and price can be pushed to their Devices through WiFi and the Transaction data will be automatically stored in the Server Database. 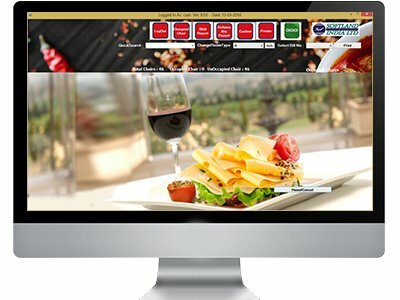 Features are, Low Cost Restaurant System, Low Cost Hotel Billing System, Cheap Restaurant Billing System, Cheap Hotel Billing System,Cost Effective Restaurant System,Cost Effective Hotel Billing System,Waiter Billing System,Steward Billing System, Low Cost Restaurant Ordering System,Cheap Restaurant Ordering System,Cost Effective Restaurant Ordering System,Waiter Ordering system,Steward Ordering System. 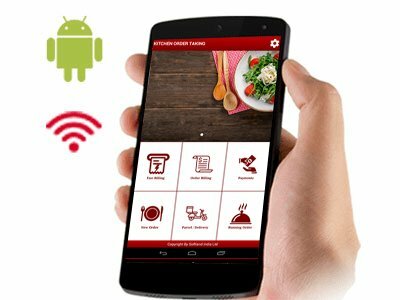 Some other features are, Android Restaurant Billing, Kitchen Order System,Steward Order taking, Table Billing, Order Taking and Billing, Restaurant Solution, Restaurant Billing, Hotel Billing, Restaurant Order taking, Cost Effective Restaurant System. 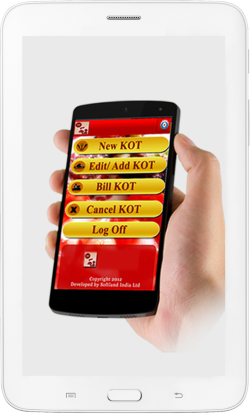 SIL KOT contains built in features of exporting various transaction data in CSV, EXCEL format. SIL KOT has an optional tally data integration module which will failute the movement of transaction data to tally ERP 9 Gold. Staging table model integration is available for integrating transaction data to third party ERP solutions. KINFRA SMALL INDUSTRIES PARK, MENAMKULAM, THUMBA, TRIVANDRUM. © Copyright 2018 by Softland India LTD. All Rights Reserved.